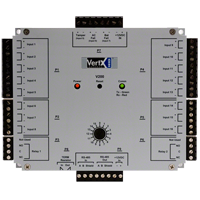 The HID VertX™ Products provide a complete and fully featured hardware/firmware intrastructure for access control software host systems. The V200 Input Monitor Interface conects upto 16 supervised input circuits. Each input point monitors and reports normal, off-normal, and alarm states. The V200 features on-board flash memory, allowing program updates to be downloaded through the network. The V200 connects to the v1000 via a high speed RS-485 network. The V1000, in turn. communicates with the system host via industry standard TCP/IP protocol, over 10/100 Mbps Ethernet, or the Internet. This architecture minimizes the impact on corporate LANs, by using only one TCP/IP address for every 32 interfaces, and by handling low-level transactions on the RS-485 network. Off-normal condition programmable for each input point (NO or NC alarm devies may be used). All connections and indicators are fully identified by silk-screened nomendclatureon the cover. Power Supply Requirements: 50 mA @ 9-18 VDC (with no readers connected) Recommended: Supervised linear power supply with battery backup, input surge protection, and AC fail and battery low contact outputs. separate supervised DC supply with battery back-up recommended for relay activated devices. RS-485: 4000 feet (1220 m) to host, using Belden 3105A, 22AWG twisted pair, shielded 100? cable Input Circuits-500 feet (150 m), two-conductor, shielded, using ALPHA 1292C (22AWG) or Alpha 2421C (18AWG).